A&A Surplus stocks new dockboards and dockplates. A&A Surplus stocks these dockboard and dockplate sizes at all times. If there is another size that you need, let us know, we can order it and have it drop shipped from the manufacturer. 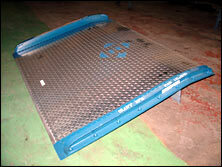 When available we also stock used dock equipment. 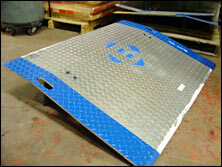 See our yard ramps. 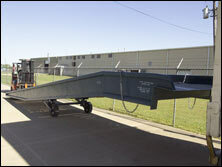 The Yard Ramp is simply moved into position at trailers, railcars, or docks. The operator utilizes a self-contained, double-acting hydraulic pump to adjust the unit to the proper position. In minutes you are ready to load or unload freight. Solid 18" rubber tires provide easy positioning and towing. 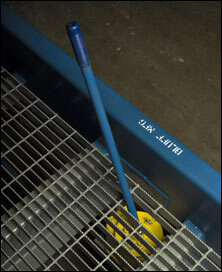 Open serrated steel grating provides excellent traction while preventing build-up of snow, water, and other debris. Beveled approach provides a smooth transition. For truck or railcar to ground applications choose a 36' unit including a level off. 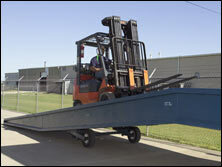 Choose a 30' straight design for quick loading from dock to ground. Both models are 36' long, 84" wide (78" usable), and have a 6' level off. We can quote a delivered price once we have your shipping address. Tubular steel box undercarriage assembly. 18" solid rubber pneumatic profile tires. 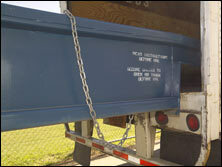 Standard safety chains hold Yardramp securely to the trailer or dock.